This incredible piece is the work of 20-year-old YouTuber DoodleChaos, who has been making intricate animations and marble run videos for over six years. In the 4 weeks since the video was published, DoodleChaos' masterpiece has been viewed on YouTube over 3 million times, featured on the popular animation site Cartoon Brew, and gilded an astounding 78 times on Reddit. His YouTube subscriber base has also nearly quintupled in size. But unfortunately, not all of the attention has been good. Any time an Internet video becomes popular, it is at risk of being stolen and reuploaded—and with no watermark or other identification in the video itself, DoodleChaos' video was a prime candidate. Within days of its launch, stolen copies of the video started to appear on Facebook. Mentes en caos, Zoomin.TV VIRAL, and GAMINGbible, to name a few, all uploaded the video via their own pages rather than linking to or embedding the YouTube original. Some gave credit to DoodleChaos and some did not, but none of these pages asked the creator for permission. Sadly, the stolen copies of the video quickly outpaced the success of the original: the Facebook reposts alone reached over 20 million views within four days, while the original version on YouTube was still sitting at a measly million. What's the big deal, you say? Well, DoodleChaos spent over a month of his free time creating this masterpiece, but the other pages and sites are reaping the benefit from his hard work: they get exposure and/or ad revenue every time someone watches the video on their page. DoodleChaos estimates that the freebooted copies of his video have been watched 40 million times to date. Imagine what those views could have done if people had watched the original on YouTube instead: using one site's estimates, he could have made $44,000 in ad revenue alone. This is where I came in. I consider myself somewhat of a freebooting vigilante—as a video creator myself, I find it very upsetting when I see creators' content being used by others without their permission, and I try when I can to contact and warn the original creators. At least a few offending videos have been taken down as a result of my pestering, and I'm proud of it. I actually saw the "Line Rider - Mountain King" video on Facebook before I found it at its proper home on YouTube. I loved the video and thought the creator deserved credit, so I did some research and got in touch with Mark Robbins, alias DoodleChaos. I sent Mark the freebooted links I found and helped him report the violations, and he was very grateful and forthcoming. He graciously agreed to answer some questions for this article about his experience with this video and the subsequent freebooting. Peter C. Davidson: This video has been very successful, garnering over 3 million views on YouTube in just a few weeks. How did you feel when this video started taking off? What has been the reaction so far? Mark Robbins: It’s a very strange feeling to describe. I felt very overwhelmed. I’m currently a junior in college, so I was trying to respond to emails and posts on Reddit with my phone while I was in lecture. It was quite distracting I must say. Seeing friends watch my video without knowing it was me that made it is a surreal feeling. PCD: How did you first find out that your video was being freebooted? "...we do not see how the content you reported violates your intellectual property rights." PCD: How did you feel when you found out that your video was being reuploaded without your permission, at times without even crediting you? MR: Although it can be “helpful” to smaller channels like mine, knowing that pages putting in zero effort are freeloading off you to massive success can be disheartening. This only applies to the people who were ambiguous in how they asked for permission or didn’t credit me at all — I respect those who emailed me asking for permission beforehand. PCD: Have you reported any more of these copyright violations? What has been the result? MR: I’ve taken down two copies of my video on Youtube so far. Youtube’s claim system I found to be much more user-friendly than Facebook’s. 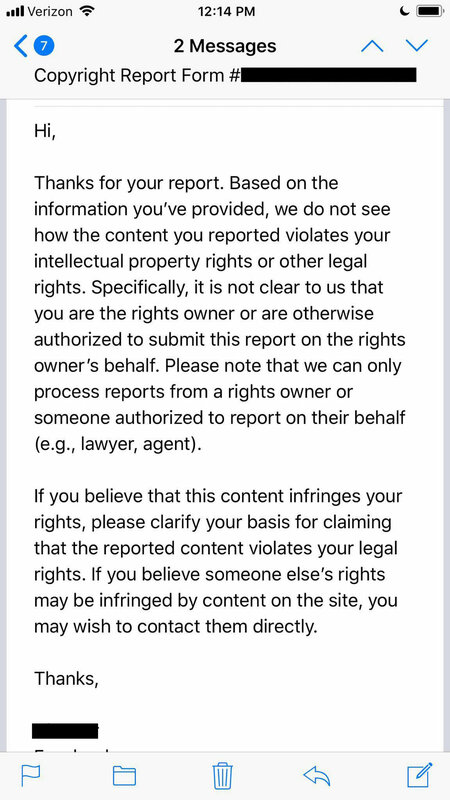 With Youtube, I felt like they were on my side — with Facebook I felt like they were protecting the freebooters because of how complicated it was to file a claim. Even if I did eventually figure out how to make the claim, enough time had passed that the virality of the video was over and the freebooters had already made their money. PCD: Some of the freebooted copies of your video have reached up to 23 million views. Do you think this added exposure of your work is worth it, even if your work is reposted without your permission? Why or why not? MR: This is the big question right here. It’s a bit of a double-edged sword. It doesn’t make me happy that these people are making so much more than me off of something I worked so hard to make, but I also realize that when my channel is this small that there’s not much I can do about it at this point. Any publicity is good publicity I’d say. Hopefully my channel gets big enough in the future to where I don’t have to accept this, haha. I know Facebook views are worth less than YouTube views (since they are incremented even if someone only scrolls past), but it would have made a HUGE difference if those estimated 40 million external views were an embedded version of my video. PCD: What do you want everyday users of YouTube and Facebook to know about freebooting? MR: If you’re a small creator, or somebody that just got lucky with a viral video like me, be very careful that you know what you’re getting into. People don’t always approach you with good intent like Peter did to me, most of the time they want to make money off of you. Capture — take a screenshot of the freebooted content. Comment — comment on the video, state that it's been stolen, and provide a link to the original source. Contact — contact the original creator with the link and your screenshot so they can file a copyright claim and hopefully get the offending video taken down. It's not a perfect solution, but it's the best way to fight back, and it certainly makes you feel better! Some of the other stolen copies of the video were taken down, but the damage has been done: studies suggest that after just 30 days, a YouTube video has already gotten over 99% of all the views it will ever receive. Just last week (on Halloween, in fact) came another interesting development to this story: A24, the studio behind the Oscar-award winning film Moonlight, posted a video on their official YouTube Channel that looked a little . . . familiar. Article by Peter C. Davidson, Video Production Specialist at Happy Fox Media.